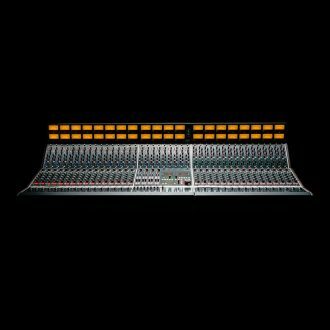 The SSL XL-Desk Mixing Console w/ 16 E Series EQ Modules is a modern twist on the classic analogue studio console. It’s designed for tracking or mixing engineers who require an analogue console within a DAW centric studio, but don’t want or need the integrated DAW control and analogue level automation other SSL console products have made the new hybrid studio standard. 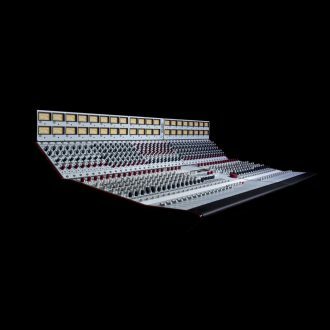 SSL XL-Desk Mixing Console w/ 16 E Series EQ Modules is in many ways a traditional 24 into 8 analogue console but it packs in an incredible collection of features. It has 20 channel strips: 16 dual input mono (switchable between main input or DAW return) and 4 stereo channels. The first eight channels have VHD mic pre’s. There is an 18 slot 500 format rack built in that can be used for processing or mic pre’s. 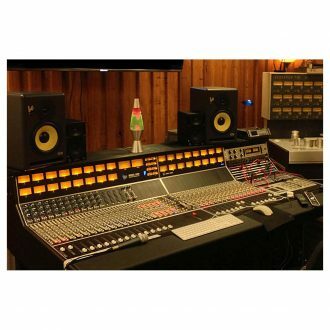 The SSL XL-Desk Mixing Console w/ 16 E Series EQ Modules ships with a legendary SSL Stereo Bus Compressor module in slots 17 & 18 (hard wired to Mix A). The rack has its own dedicated high spec’ power supply. There are four main Mix Busses (A, B, C, D) with buses B, C and D able to be summed into Mix A. The Busses and channels can access the 500 rack and each have a separate insert point for processing. There are two mono aux sends and two stereo return inputs. Direct outputs on every channel, stereo return and mix bus enable convenient stem printing. Each channel has a Cue Stereo Bus section (with Pan and Volume) used to provide one of the headphone mixes while tracking. 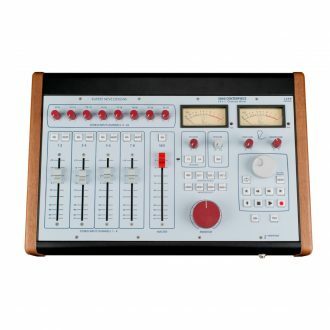 At mixdown the mono channel DAW return signals can be routed to the CUE ST bus and then summed into Mix A, so there are 16 main faders + 16 Cue ST inputs + 4 Stereo channels providing 40 summing inputs (using the stereo returns and insert Sum functions you can squeeze in over 50 summing inputs). There is also a fully-featured monitoring section with bass management (3 sets of speakers + subwoofer), Foldback A and B with individual talkbacks for headphone mixes and a built in Listen Mic input + classic compressor circuit, with its own direct output. SSL XL-Desk Mixing Console w/ 16 E Series EQ Modules features 8 of SSL’s patented Variable Harmonic Drive (VHD) microphone preamps, built-in to the first 8 channels of the console. The VHD pre can deliver clean SSL grade recordings but also features the VHD circuit used in our acclaimed Duality console* which can be switched into the signal path. The Variable Harmonic Drive circuit uses a 100% analogue signal path to generate rich harmonic distortion. As you increase the input gain, the Variable Harmonic Drive circuit introduces either 2nd or 3rd harmonic distortion or a blend of the two to your source material. At lower gain settings it adds gentle valve-style warmth or a touch of transistor edge. As the gain is increased the more extreme the distortion becomes until at high gain settings it delivers fierce trashy transistoresque grunge. VHD pre’s give the user the ultimate versatility from a studio grade preamp. Whether it’s ultra-clean traditional SSL, subtle warming or totally trashy transistor distortion, VHD will change your expectations of what a preamplifier should deliver. The may be compact but it features all of the classic SSL channel strip features which make our consoles so versatile and accommodate such a wide range of production requirements. 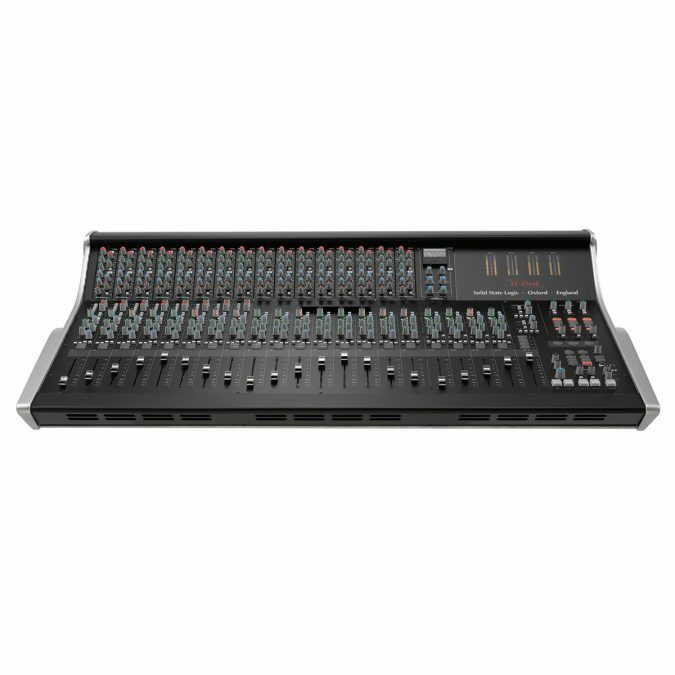 SSL XL-Desk Mixing Console w/ 16 E Series EQ Modules has 20 channel strips. The first 16 channel strips are dual input mono, meaning they can be switched between a main input and a DAW return whilst tracking. The Remaining four strips are stereo channels. Channels 1-8 have VHD mic pre’s. Channels 9-16 are line level but can use the 500 rack for mic inputs if desired. Each mono channel can access a corresponding 500 format module and also has a separate traditional Insert point. The four stereo channels cannot access the 500 rack and do not have Insert points. All of the channels have an additional Direct Output to facilitate printing processed material to your DAW and this can be switched between pre-/post fader. Each channel has a +/-20dB Trim control which can be used in a couple of ways: for VHD channels in can be used to control the output level from the VHD into the channel when using heavy distortion, when used with a 500 rack module it can be used to drive the level into the inserted module. There is a phase invert switch. Beside the Trim control is a tri-colour signal indicator LED. The metering on XL Desk can be switched between +24dBu and +18dBu Scale to give the following LED settings. 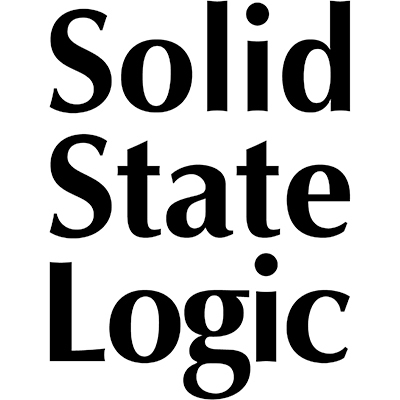 For many of our users combining different tonal characteristics from a range of analogue equipment by a selection of manufacturers is an integral part of their sound. The popular modular ‘500 format’ facilitates the use of a wide range of analogue processing modules from different manufacturers. So, built into the penthouse of XL-Desk is an 18-slot 500 format rack. This rack can be loaded with any combination of SSL or third-party 500 format modules, as desired by the user. The in-built 500 rack offers the user the opportunity to add their own favourite sonic flavours to their SSL console, whilst keeping it all within arm’s reach. The SSL XL-Desk Mixing Console w/ 16 E Series EQ Modules rack has its own dedicated power supply, separate to the power supply for the rest of the console. Unlike many stand-alone 500 format racks the XL Desk rack has a very highly specified power supply which should deliver sufficient power to accommodate your selection of modules. SSL cannot guarantee compatibility but has tested this rack with over thirty different modules. 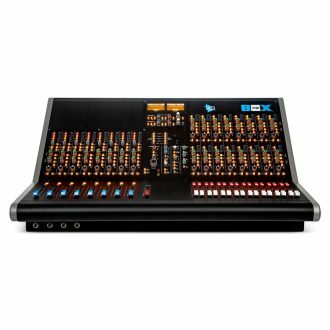 Each of the mono channels of the XL-Desk (1-16) has access to its own corresponding slot in the rack and the channel strips access them via a ‘500’ Insert button. The four Stereo channels cannot access the 500 rack. Slots 17-18 are hard wired to Mix A to accommodate a stereo mix bus compressor and SSL XL-Desk Mixing Console w/ 16 E Series EQ Modules ships with these slots pre-loaded with 500 format module version of the legendary SSL G Series Bus Compressor. The console will ship with a new version of this module which features a sidechain HPF. The four Mix Busses can also access rack slots 9-16 (in stereo pairs) although the Mix Busses and mono channels 9-16 cannot use the rack slots simultaneously. The inputs and outputs of module slots 1-16 are accessible via standard DB25 connectors on the rear panel. This does mean that the modules are not hard wired into the mono channel strips 500 Insert send/return, but the console does ship with a set of external DB25 jumper cables to facilitate this approach if required. The advantage of our opting not to hard wire the rack into the channel signal flow is of course that if desired (and we do recommend this), the rack can be connected to a patchbay for ultimate flexibility and creating chains of patching between 500 modules. Furthermore, this means that the 500 rack can be used ‘standalone’. The 500 rack can also accommodate stereo modules that comply with the pin 6 link specification – the switch to assign an odd/even pair of slots to stereo operation is internal so must be set before the module is fitted. Designed by the team behind Duality and AWS, XL-Desk delivers the kind of stunning audio quality only associated with SuperAnalogueTM SSL consoles. The SSL XL-Desk Mixing Console w/ 16 E Series EQ Modules provides the sought after separation, clarity and punch behind thousands of hit records made on SSL consoles. Everyone agrees that the sonic magic of an SSL console happens at the Mix Bus but one bus is not always enough! Many high-profile mixers use multiple mix busses to create parallels or sub-groups of instruments, helping them to compress and manipulate sounds in unique ways. These ‘tricks of the trade’ are some of the most effective to help take a mix from ‘good’ to ‘great’. The SSL XL-Desk Mixing Console w/ 16 E Series EQ Modules provides no less than 4 mix busses – A, B, C and D. Mix A is the master bus, from which the final stereo mix is derived. This has its own 100mm fader. Mixes B, C and D each have their own level control and crucially, the ability to sum into Mix A. All 4 Mix Busses have Direct Outputs for DAW printing, separate standard stereo Insert points and have the ability to access slots 9-16 of the in-built 500 format rack. 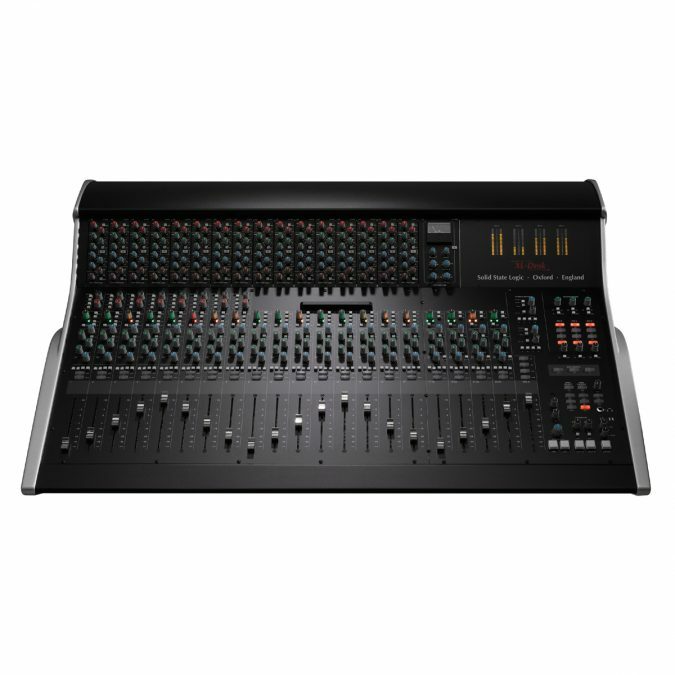 – Mix B, C and D – Can be routed to Mix A, with independent level controls, stereo insert points, access to 500 rack slots 11-16. 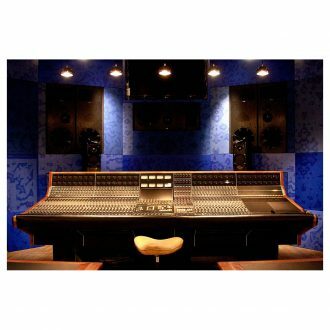 The monitoring system of any professional music environment is one of the most important parts. 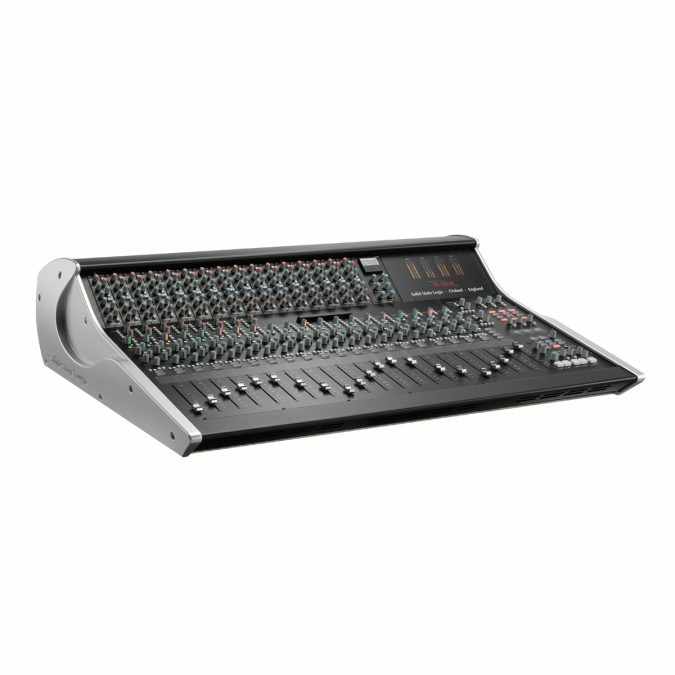 The SSL XL-Desk Mixing Console w/ 16 E Series EQ Modules offers a pristine, SuperAnalogueTM monitoring section, packed with useful features. There are three sets of stereo monitor connections (Main, Mini 1 and Mini 2) plus a sub connection. These are controlled by a front panel button matrix with individual Level controls. The sub connection has bass management: When the SUB is engaged, the bass management sums left and right signals through a 3rd order low-pass (high cut) filter at 80Hz and sends the sum out of the Sub monitor output. Also, 2nd order high-pass (low cut) filters are inserted into the selected left and right monitor outputs. 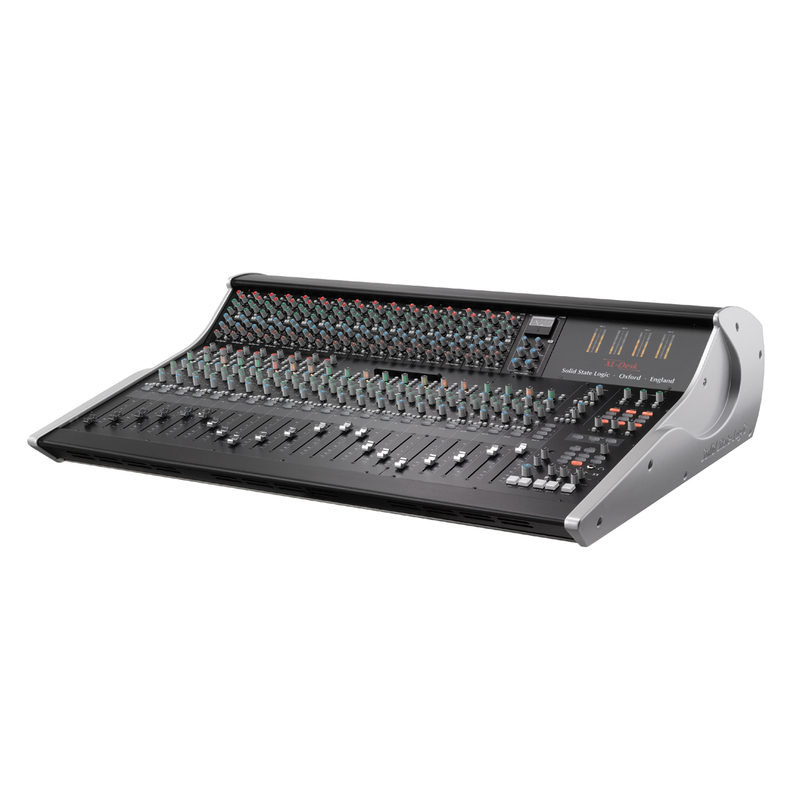 The bass management on SSL XL-Desk Mixing Console w/ 16 E Series EQ Modules is intelligent. It will remember if the SUB button is on or off for each speaker set. The Monitor Source can be selected from; Mix A, a separate External rear panel input or the front panel iJack input and a Mono button folds down these monitor sources to mono if desired. A Monitor SUM button allows any combination of these to be summed and monitored. There is a large Monitor Level control and an associated DIM button (with DIM Level control), CUT button and an AFL Level control. Having clear and easy communication between the performer and the engineer/producer is crucial to the smooth creative flow of a recording session. XL Desk has two Foldbacks with individual Level controls and Talkback. Foldback A is fed by the CUE Stereo and Foldback B is fed by Aux 1. MON buttons below each Foldback’s level control override the default Foldback source (Stereo Cue or Aux 1) and replace it with whatever is selected as the main monitor source. This is really useful for quickly playing back the studio control room mix to the performer(s) in the live room. There is an in built talkback microphone with a Talk button and Level control. A set of DIP switches on the rear panel allow the TALK button to be configured as latching or momentary. Also, Talkback can be set to either SUM with or REPLACE the existing signal. A Listen button allows the engineer to monitor a live room listen mic if one is connected and this too has a Level control. XL-Desk also includes the classic SSL Listen Mic Compressor. This is an aggressive compressor ideal for ensuring a very strong signal from the live room listen mic but can also be used as a process effect to create the classic heavily compressed 80’s drum sound which was created using this circuit. 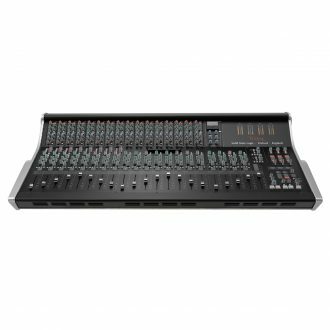 The SSL XL-Desk Mixing Console w/ 16 E Series EQ Modules Listen Mic Compressor has no controls, it is simply always on and it has a dedicated external output to facilitate its use as a process effect. – Bass Management with filtering – Connect a subwoofer to extend your low-end monitoring. – Intelligent bass management automatically switches in or out with each speaker set. – High-quality in-built talkback microphone mounted into the console’s front surface. – Listen Mic input and compressor circuit – allows a dedicated ‘listen’ microphone to be set up in the live room, so that the engineer can easily hear what the performers between takes. In addition, a discrete Listen Mic output is available for recording ‘that’ legendary heavily compressed sound! There are good reasons why so many leading engineers and producers still choose to mix on a console. Some of them because of sonic aspects and others because of workflow choices. Mixing out-of-the-box gives a wider sound-stage and a distinct colouration that no plug-in can equal. We’re also told that it’s easier to get a mix together quickly with a console and feels more intuitive than a mouse. 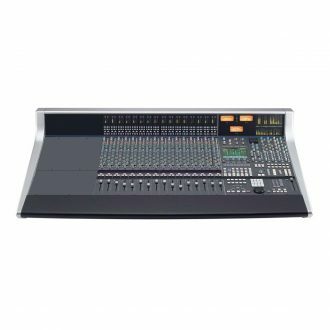 The SSL XL-Desk Mixing Console w/ 16 E Series EQ Modules gives a full-featured console workflow, but with a project-studio friendly footprint under 1m2. With 2 insert points on each mono channel you can mix and match rackmount and 500-series processors to make the XL-Desk the hub of your hybrid studio world! Connect your XL-Desk to a patchbay for ultimate flexibility, and use the direct outs from every channel and Bus to print files back into your DAW for easy mix revisions. The SSL XL-Desk Mixing Console w/ 16 E Series EQ Modules User Manual includes a series of detailed tutorials covering different workflow which can be achieved with XL-Desk, including the connectivity required to achieve them. – Recording a small ensemble in a ‘split’ console style.